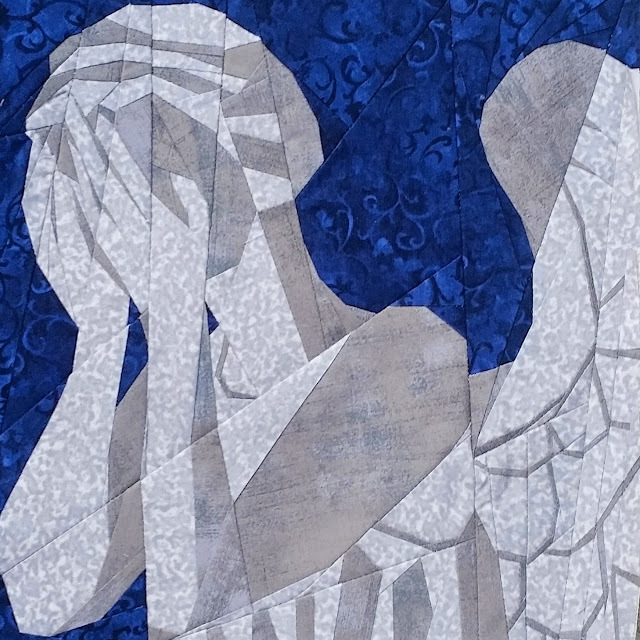 It took me all week, but, finally, I finished my Weeping Angel block!!! This is the most intense paper pieced block I've ever attempted. It had 31 pieces of paper and, I counted, 248 fabric pieces. All for a 12-1/2" block! But it was so worth it! Isn't she gorgeous! She's not perfect, I see all the little alignment problems, but my niece says she's perfect and that's what matters. Tomorrow our link party for our leaders/enders will open so be sure to stop back by and link up! We'd love to see your progress! Today I'm linking up with Design Wall Monday at Patchwork Times, Monday Makers at Aylin-Nilya, Monday Makers at Hug-a-Bit Quilts, and Main Crush Monday at Cooking Up Quilts. And Tuesday with Quilt Story for Fabric Tuesday, Show and Tell Tuesday at I Have to Say, Linky Tuesday at Freemotion by the River, and Sew Cute Tuesday at Blossom Heart Quilts. And Wednesday with Freshly Pieced for WIP Wednesday, My Quilt Infatuation for NTT, and Sew Fresh Quilts for Let's Bee Social. 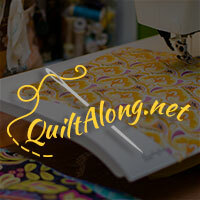 And finally, on Friday, with Fort Worth Fabric Studio for Fabric Frenzy, Quilt Art Designs for Paper Piecing Friday, and Can I Get a Whoop Whoop from Confessions of a Fabric Addict. This is amazing beautiful. You have a lot of patience, but it is so worthwhile. I will come back to see all blocks and the finished quilt. Wow this is beautifully detailed! A lot of deep breaths would be required of me to do a paper piece like this but there is something wonderful about intricate paper piecing. She's wonderful! I would never get through that, but your work is beautiful and I'm glad you did. Yep, she looks fantastic! Very nice job, great choice of fabrics too! That is awesome! I love your choice of blue for the background, too. What an accomplishment. Your angel is SO BEAUTIFUL! I love all she represents and your workmanship is divine. I think it's fantastic. WHAT alignment problems?? I take it your niece is a Dr. Who fan like my sons. Super cool block. Oh, my - that is some complicated paper piecing! You did an awesome job. I don't see any alignment issues at all, just that incredible angel. that is a fantastic block - I think you did a great job with it. Oh my....that's stunning! Huge Who fan and a quilter so I'm equally amazed on both fronts. I see nothing amiss with it. It's perfect!! Great job! I love paper piecing, but I don't know if I'm good enough at it to do that! She looks pretty good to me! Love the fabrics! Yes, that one is one of the most advanced patterns from the whole Doctor Who pattern set. You did a great job with it. Looks fantastic!! Love your angel! (Out of all the Doctor Who episodes I've seen, the first weeping angel episode was the only one that gave me nightmares!) What will you do with her -- pair her with other Doctor Who blocks or finish her off as a mini? Beautiful--and all the more so knowing how small the block is! Wow. Wait.What. It's a block not a quilt. I"m in awe!!! Really neat piece, love the fabric and how they pop against the background. Wow - that's seriously impressive!! It really looks like a statue with the grey on grey aspect to it. You must have been very patient to do all that paper piecing. Thank you for linking up with Sew Cute Tuesday. So cool!! What are you going to do with her now that she is done? Is there a larger Whovian quilt in the works? That is amazing!! You did a great job making it. Your angel is beautiful! I can't even imagine how much patience this took, but it was so worth your effort. It is gorgeous! Thanks for linking up to Main Crush Monday!